Donald Trump isn’t the only one with worries about a border wall. In Tehlor Kay Mejia’s prescient dystopian debut, a wall separates the fantasy island of Medio’s haves from the have-nots, the oppressed from the oppressors. On one side of the wall: poverty, famine, desperation and . . . rebellion! On the other side: comfort, privilege, and luxury, particularly if you’re Daniella Vargas, top student in the Medio School for Girls and eagerly awaiting marriage to one of the ruling class’s elite powerful sons. So says the “Medio School for Girl’s Handbook, 14th Edition,” but Dani, groomed at an early age to be a Primera, or first wife, behaves like a girl with something to hide. Why? Because her past is full of secrets and her present uncertain and confused. After taking her vows, Dani’s duty will be to oversee her husband’s household, manage his social calendar, support him the way her lifetime of training to be a first wife has taught her. But there’s a catch: she’ll be sharing her husband with Carmen, a Segunda or second wife, groomed to be her opposite. Primeras are wise and discerning, witty and loyal, while Segundas are beautiful and brave, nurturing and passionate. Opposites are supposed to come together to make a perfect whole, yet it just so happens that Dani’s opposite is also her arch nemesis. Or is she? Mejia’s Daniella comes across as a strong feminist struggling with her role as a privileged Primera in a land seething with injustice and rebellion. With the resistance gaining steam, will she sacrifice her life of privilege to aid the underdogs? Does she want to “do more than exist on the fringes . . . fight back against the husband who thought he could control her, the government who thought they could decide who deserved to live and die?” Will she make her own choices, or retreat back into the elitist lifestyle for which she’s been forever groomed? And how will she act on her confused feelings of lust and forbidden love? Tehlor Kay Mejia is no Ursula Le Guin. The politics in We Set the Dark on Fire are shallow and superficial. There’s good and then there’s evil—enough said. And Dani’s tentative foray into romance, which increasingly takes center stage as the novel progresses, often reads more middle schoolish than newlywed. But still, with lots of action and palace intrigue, the novel is a page turner. And in the present-day dystopia that is Donald Trump’s America, it’s damn good to see a young, queer, feminist heroine rising to the occasion as she grapples with so many timely and relevant issues. The decision as to whether to be content with a life of wealth and privilege or actively step up, confront that privilege, and engage in fundamental societal change has never been more relevant. As Dani struggles with these decisions and their profound repercussions, so should the reader. 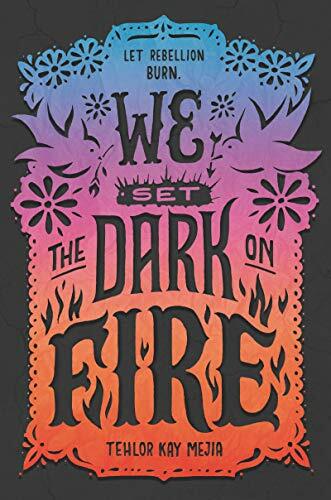 We Set the Dark on Fire is book one of a fantasy duology and ends in a cliff hanger. Readers beware: You’re going to have to wait for who knows how long until its sequel is released.